Craft beer will be a hot topic in February when Geelong celebrates the return of the Great Australian Beer Festival. 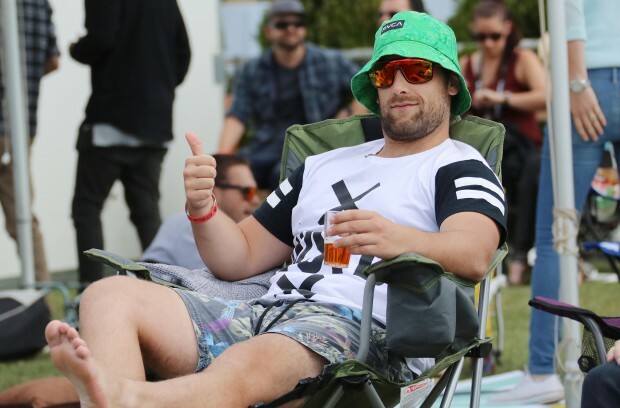 Back for its seventh year, the Geelong Racecourse will be filled with an abundance of pop up bars, street food, live music and DJs on Saturday February 16, with all the fun kicking off from 1pm right up until 8pm. With the recent explosion of the Australian craft beer scene, the festival is a celebration of both local and state-wide breweries, showcasing hundreds of different brews with a variety of styles of beer and cider – enough to please any taste bud. The festival currently has more than 35 brewers involved, including the likes of Blackman’s Brewery, Mt Duneed Estate, Little Creatures, Bright Brewery, Kaiju!, Hawkers, Pirate Life Brewing, Two Birds Brewing, and iconic surfer Mick Fanning’s own Balter Brewing Company – just to name a few. What we really love though is the fact that it’s also the only festival in the world (yes the world!) that has all Geelong and regional brewers attending the one single event. It would almost be rude not to spend a part of your day getting around to these local beauties and the other tasty brews from across the nation. Armed with your festival ticket, festival goers will receive a 200ml tasting glass for copious amounts of beer and cider tastings from the pop up bars in exchange for tokens (where tokens act as cash). This year though, the team have gone above and beyond to ensure an epic summer’s day out and have not only added larger tasting cups (285ml glasses), but are also encouraging brewers to sell their beers by the can; for those brewers who have them. Tinnies, sun and mates from all walks of life (not just haughty hipsters or boring box-tickers) – you couldn’t ask for a better day, and we have the organisers Mike Ward and Kieran Blood to thank for that. So, as well as mind-expanding beer, look out for the impressive roster of live acts, a funky piano bar, local DJs Chook & Moluck on the decks, keg rolling, a series of wacky races to enter and heaps of foodie delights including Boss Burger, a variety of smokin BBQed meats, seafood, pizza and vegan fair. There will also be a series of masterclasses over the day, giving beer lovers the opportunity to meet and mingle with the brains behind the brands, learn how to pair beers with a variety of foods, and even watch live brewing demonstrations. The festival can be as serious or as lively as you want it to be – even if you consider yourself an absolute novice when it comes to beer, you’ll probably leave Great Australian Beer Festival with a new favourite drink. Mick has been a staple of Melbourne’s music scene for well over 25 years. Raconteur, troubadour, balladeer and poet, he’s best known for his Blundstone-wearing song master of pub-rock icons Wedding Parties Anything. His band The Roving Commission features Squeezebox Wally on Piano Accordion and a rotating schedule of talented performers to keep the party alive. Great Gable are four mates from Perth and combine a wide range of influences to bring a subtle twist on the alternative-indie sound. The band have had a stellar year in 2018, selling out two national tours in support of their recent singles Pillars and Golden Slums. They’re kicking off 2019 with a new single Cool Mind Blue, as well as their biggest national tour to date. If you haven’t heard of them before, re-prioritise your day because with the quality of their music it’s only a matter of time until they’ll be headlining festivals and selling out rooms across the country. Australia’s legendary 13 piece Soul Music Orchestra, with an unsurpassed record for presenting the finest, most entertaining and authentic soul music experience in Australia since 1981. It is also a quality reading backing outfit of 10 musicians + 3 singers, who can perform any style or genre, in the vein of the Funk Brothers. Joe is without doubt Australia’s most formidable and respected bass players and has worked for artists such as John Farnham for 13 years, Olivia Newton-John, Kylie Minogue and currently The Black Sorrows. Joe’s Into The Mystic show sees his 7-piece band effortlessly recreate the feeling of those heady times of Van Morrison; a journey that begins in the 60s and moves through the decades encompassing Van’s worldwide hits. A band of brothers from regional Victoria, a five-piece rare alternative/folk outfit, sticking to their southern stomp roots. Their journey is to develop and spread an Australian folk/roots sound, never to be pigeon holed. Fuelled by fiddle and strong rhythm their music is bound to invoke! Stumble into the world according to Skyscraper Stan and the Commission Flats – a hazy, sweat-soaked dream of sunburnt cul-de-sacs, dirty inner-city intersections and hot, muggy bedrooms. A gaunt 6’6”, Stan cuts an ominous figure on stage and has developed a loyal national following through his charismatic live performance. Dixieland punk, sailor songs, weird carnie show tunes and the odd bit of curious pop – their music is joyful, beautiful and a bit dirty and wicked too. Their act is a lilting, luring, sensual haze of smoky opiate vocals that transport the captivated audience to a redly lit burlesque bar from the 1940s, where the smoke curled thickly in the air and people only ever drank whiskey. With trombone, sweet and sassy vocals, toy piano, guitar, half a drum kit and an abundance of foot stomping, their melodies are infused with wild exuberance and joie de vivre – a Lily and King gig is a truly wild and joyful experience. The boys in Papaya Tree are young, fresh and eager to please (if you’d let them). Described as being sweeter than their namesake fruit, the six-piece came together through a number of unlikely situations, from a butcher shop to the school yard and university walls, eventually forming the full line-up from nearly every postcode in Sydney. Due to the bands size, Papaya Tree have had the opportunity to create an eclectic mix of styles, taking elements from rock, funk, jazz and reggae to create their sound. Velvet Bloom is a Melbourne based music project – foundered by Maddy Herbert. Maddy’s a story teller who uses her jazz/balled style vocals and soul/pop sound to bring her emotive lyrics to life. Whether you prefer Belgians or Blondes, Pales or Pilsners, Saisons or Wits – get along to GABF Geelong on Saturday 16th Feb to Explore, Discover & Enjoy this epic day out. Tickets available via www.gabfgeelong.com.au, along with a complete list of participating breweries and live entertainment.